Back in the day, one of the biggest problems with creating an effective back-up routine was finding enough space to put everything. With the advent of big, fast and ever cheaper USB2 external hard drives, that's no longer a problem. With this in mind, Norton Save & Restore 2.0 kicks off by automatically scanning your system, hunting down any external hard drives, flash memory devices and other storage systems, choosing what it thinks is the best destination for your backups. If you have more definite views about where you want your back-up destination to be, you can override the automatic options manually. Another nice touch is that the program automatically monitors your system for the addition of any new internal or external storage devices, offering to add them to a list of back-up sources or destinations. Couple this with installation checks for the correct operation of the Symantec Recovery Disc, and the creation of custom recovery discs if required, and Norton is off to a flying start. All too often, even high-end back-up software only gives you one choice. Either you can create an image of your entire hard drive, or you can back up selected files and folders. Despite a competitive price tag, Norton's main advantage is that it can do both. First up, you can create images of your entire drive, or drives, so that if you have a complete failure, you can reload Windows, all your programs, settings and files, just as they were before, in one fell swoop. 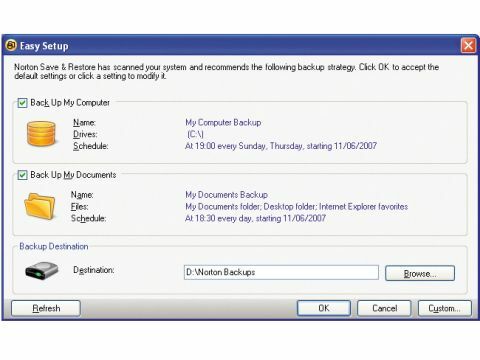 To save on time and storage space, you can create incremental disk image backups as well as the more normal "one-time back-up" option, so that only the data that has changed is stored in extra, supplemental files. As well as disk image backups, Norton offers a complete file and folder back-up system. Again, this is fully customisable, so you can choose exactly which files and folders you want to add to your backup list. Better still, you can add file types to backups so, for example, you could choose JPEG files and the system would scan your entire hard drives looking for photos to back up, just in case any have been stored in unlikely places that you've forgotten about. Best of all, along with its wealth of back-up options for different levels of compression, encryption and password protection, the scheduling system is equally effective and easy to set up, complete with throttling adjustments. These enable you to select your preferred trade-off between back-up speed and how fast PC and even network operation continues to be during the process. In our tests, with maximum performance dedicated to backup and using an external 500MB USB2 hard drive as the back-up target, the disk image system returned speeds of 1.25GB per minute using the standard compression level and 0.65GB per minute at the highest compression level. However, the compression ratio worked out almost exactly the same in both cases, reducing 104GB of hard drive data to a 95GB disk image, so you're probably better off going with the standard compression level and getting the extra speed. The image file itself is stored as a number of sequential files (with options for the maximum size per file), making it easy to bounce old backups onto DVDs. With its speed, sheer ease of use and amazing versatility, Norton Save and Restore 2.0 is definitely a winning package.